Webster Soil Series. Photo Courtesy of Iowa State University. Webster Soil Series. Photo courtesy of the Iowa State University Extension and OutreachHappy World Soil Day everyone! I’ll be honest, I kind of forgot about it until I opened up Twitter this afternoon and saw all of my fellow soil scientist’s happy tweets about it. However, I celebrated by looking up the soil classification of the soil on which I grew up, i.e. the soil underneath my dad’s house. 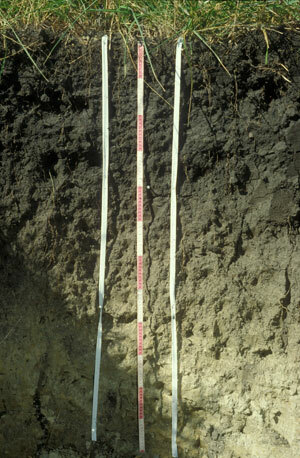 It was the Webster series – fine-loamy, mixed, superactive, mesic Typic Endoaquolls (Soil Taxonomy). It is a Mollisol, which is an organic-rich soil that formed under prairie in northern Iowa. If you live in the US, and want to look up your soil, go to the Natural Resource Conservation Service’s (NRCS’s) Web Soil Survey, or click on the picturebelow. If you’re familiar with the web-based program you can find your soil’s classification, or you can just look up the soil series Official Series Description. Once you find it, please post it in the comments. I’m curious to read about all of them. This entry was posted in Found on the Internet, Lessons in Soil Science, Soil Geomorphology and tagged Iowa State University, Mollisol, NRCS, soil, Web Soil Survey, Webster series, World Soil Day, WSS. Bookmark the permalink.